The most significant city on Hungary's Southern Plain in terms of size and status, Szeged is surprisingly rather underrated when it comes to tourism. This seems a little unjust, since Szeged has so much to offer tourists, with year-round performances at various theatres, opera houses and concert halls, and a rather pretty and appealing city centre, divided by the River Tisza. On top of all this charm and character, the local cuisine is sure to please, with the famous Szeged salami (Pick), together with local paprika, which sits so nicely with the local speciality of spicy fish soup (Szegedi halászlé), which is often made with fish caught from the winding River Tisza itself. Central Szeged contains a number of large and rather beautiful squares, such as the Széchenyi Tér, which is graced by the magnificent town hall. Close by and on the Dugonics Tér, the Tourinform office offers a range of tourist information and is tucked away from view, in a peaceful courtyard. Much of what you choose to do in Szeged depends entirely upon the season. In the summer season, a number of beaches present themselves, on the other side of the River Tisza, in the area known as New Szeged (Ujszeged). The city also contains several excellent thermal baths and spas, two imposing synagogues (Uj Zsinagóga and Ozsinagóga), and a beautiful town hall with Neo-baroque architecture, which presides over the Széchenyi Tér. For families, spend a day at Szeged Zoo, where around 9,000 exotic animals and creature reside. 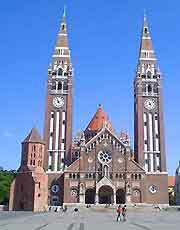 More information about Szeged Tourist Attractions and Landmarks. If you are looking for information about the history of Szeged and the Great Plain, then the Ferenc Móra Museum may well be the place to start, since it contains artefacts dating from the 1st century onwards. Something quite different to literally spice up your day is the Pick Salami and Paprika Museum, where you can learn more about Szeged's tasty specialities and even sample some of the salami. For religious treasures, the Cathedral Museum on the Dóm Tér is quite unmissable and contains many valuable religious paintings and artefacts. More information about Szeged Museums and Art Galleries. Hungary's capital of Budapest is just over two hours from Szeged and is therefore close enough to warrant inspection, particularly its Royal Palace (Buda Castle), medieval city walls, and exciting roller coasters at Vidam Park. Tourists based in Szeged should also consider sampling the spicy 'csabai' sausage at Békéscsaba, strolling along the cobblestone streets within Csongrad's Castle District, and visiting Hungary's premier arboretum in Szarvas, where there are over 30,000 different trees growing. 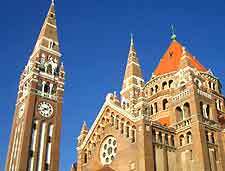 More information about Szeged Attractions Nearby.